Byrds founder Roger McGuinn released his first ever solo live album on Nov. 19, 1996, on Hollywood Records, a Walt Disney Company. The album contains 16 live performances culled from shows over the past two years as well as two bonus studio tracks that were recorded with members of the Jayhawks at Terrarium Studios in Minneapolis in late September 1996. "We don't really know what venues which songs come from. That's why it's called 'Live From Mars,' " McGuinn said in an E-mail. The studio tracks, both McGuinn original compositions, will likely be a highlight for Byrds fans, as they are the first studio recordings released since "Anna," McGuinn's cover of the Arthur Alexander tune that appeared on the Alexander tribute album. 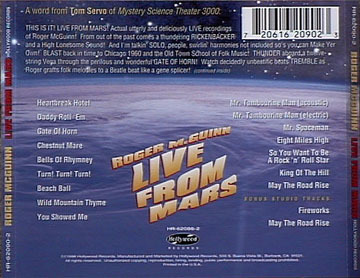 "Live from Mars" is the first McGuinn album since 1991's "Back from Rio." The album will be presented in the format of a typical McGuinn solo show. Since about 1994, McGuinn has organized his solo acoustic shows as a sort of audio/oral autobiography in which he describes and then plays in a chronological fashion some of the musical influences that shaped him. "This is more than just a live album; it's kind of a one-man play, like 'The Life of Will Rogers' or something. It covers a lot of historical ground,McGuinn was quoted as saying in the November issue of ICE newsletter. Thanks to Richard Russell for this overview of "Live From Mars."